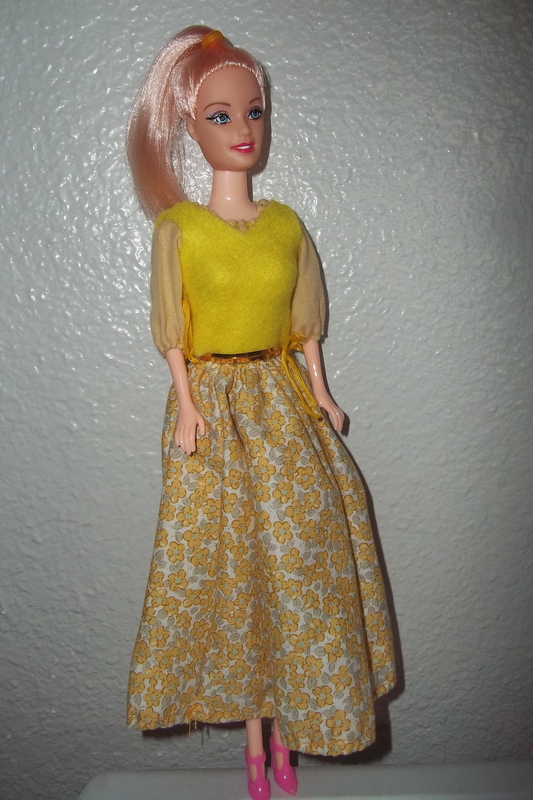 Flowered Peasant Dress For Sale! Also see the Red Velvet Elven Dress for sale here! I made this dress for my cute little 3-year old cousin, who likes 1) dolls and 2) pink :). 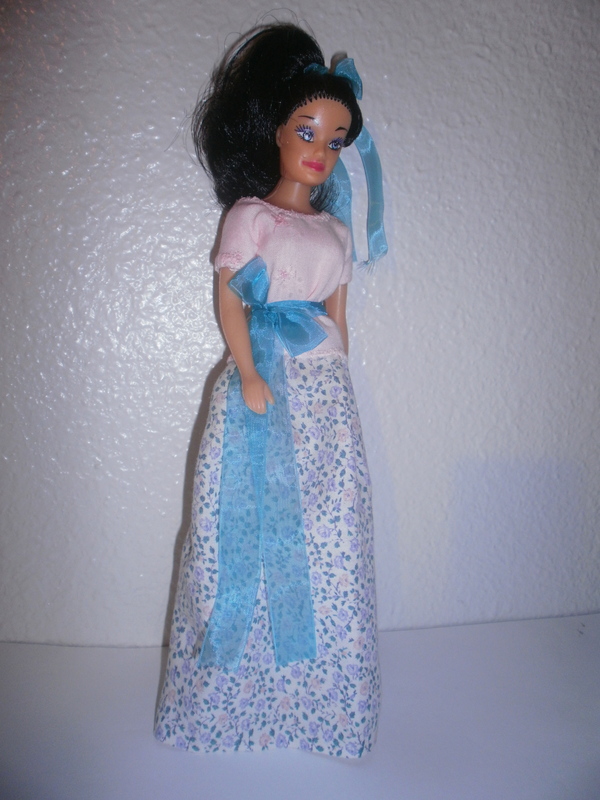 The straight, blue-flowered skirt was one of the first pieces of doll clothing I made. 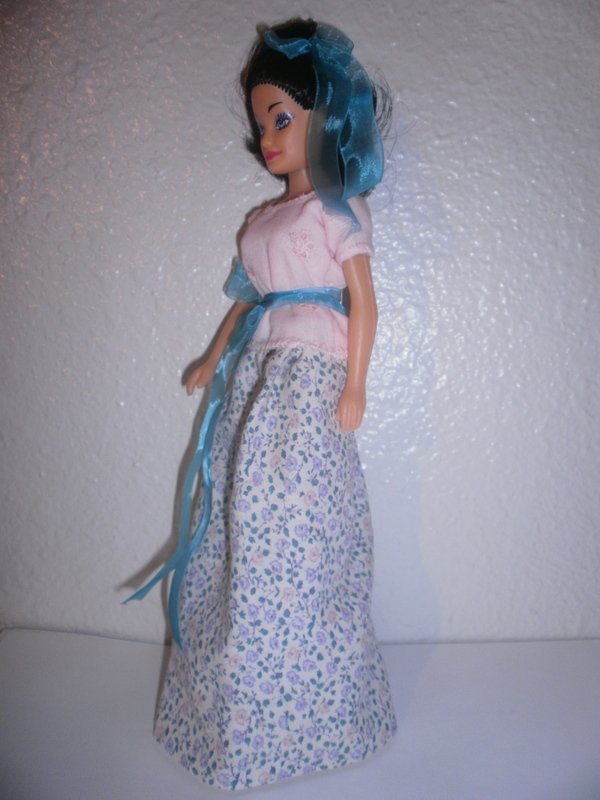 Then I used the complementing pink-eyelet cloth (which I also used for the Pink Picnic Dress) to make a top. 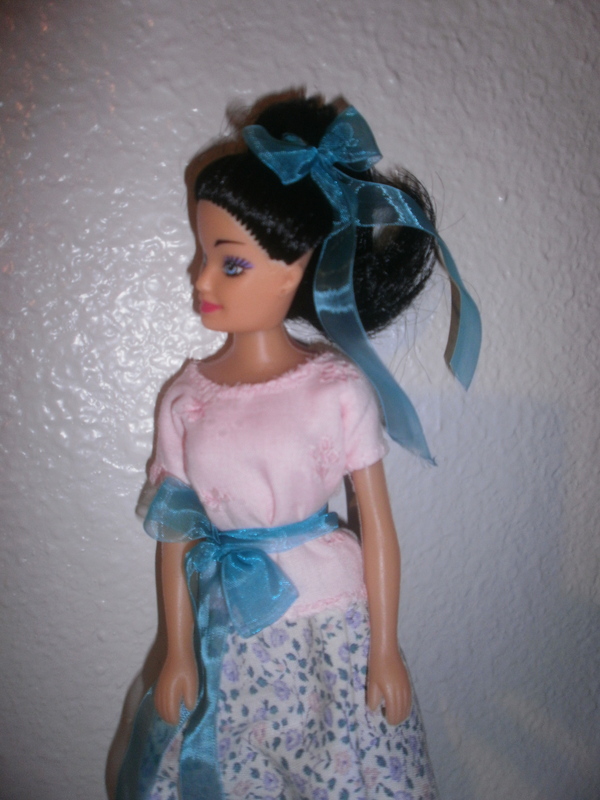 A sheer blue ribbon sash and hair bow complete the outfit. To start with, there’s the superhero staple–a spandex supersuit! I made that out of a dark blue sock that had a great stretch to it. It’s all one piece. Then i took the silver corset and halter top off of the Sci-fi girl‘s outfit, because I felt it would look better with this outfit. (You can read more about how I made the silver corset and top here.) 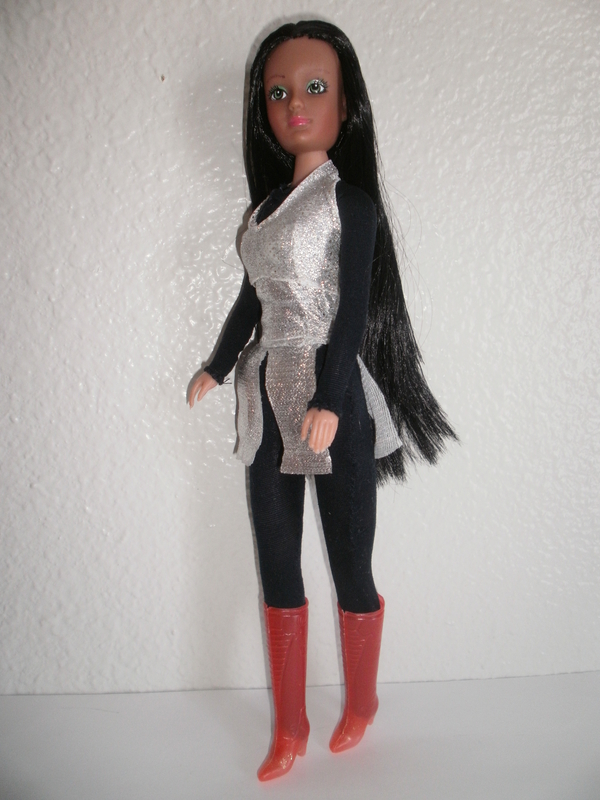 Red plastic boots (which I didn’t make) complete the outfit. This dress I made as a birthday present for my very good friend Hannah, who was also my music teacher before we moved. Her favorite colors are yellow, green and blue, so I used the pastels I had in all those colors. 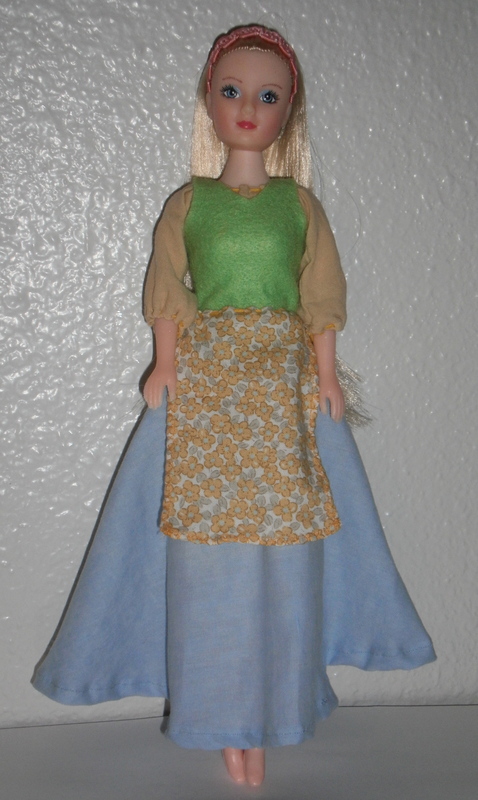 There’s the yellow chemise with gathered neck and sleeves, the blue skirt (a half-circle this time), and the green felt vest, laced up in back. 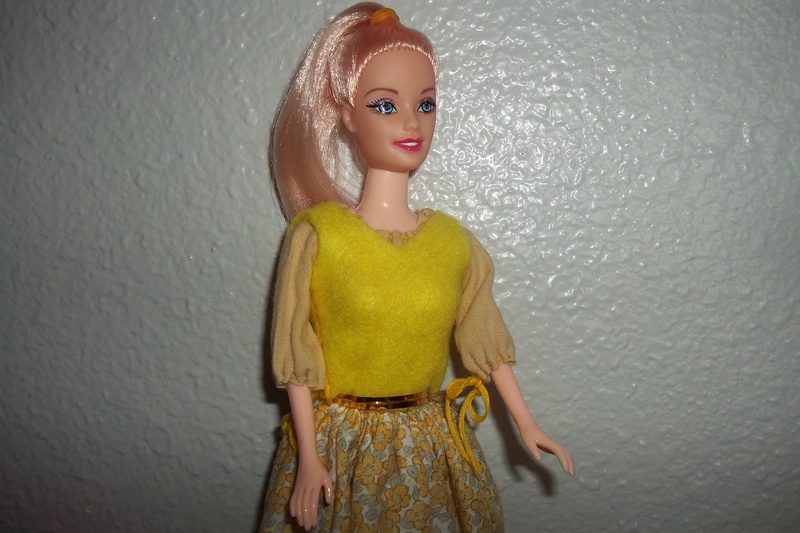 Also worn are a yellow flowered apron and a headband, made of a piece of pink trim. 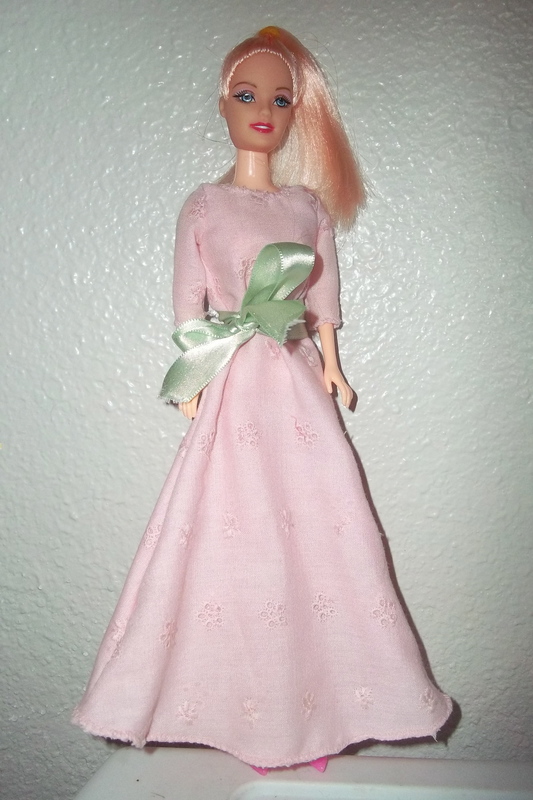 My grandmother, knowing how much I like pretty doll clothes, sent me this doll for my birthday! She is dressed in a traditional Asian Indian outfit (which I didn’t make :)) called a Salwar Kameez. 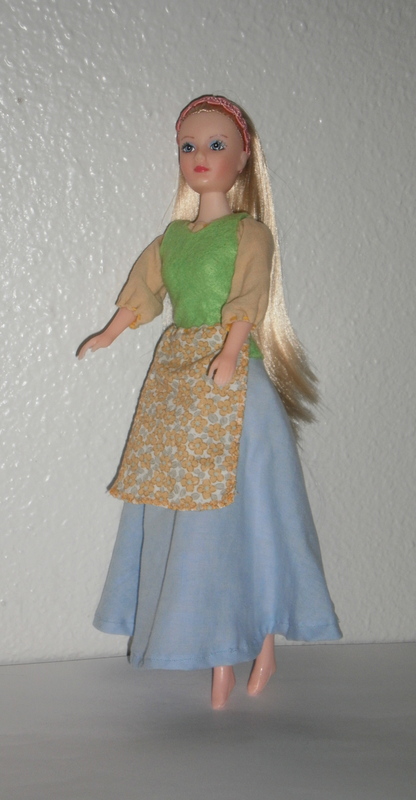 First there’s a tunic, which is sometimes slit up the sides to about the waist (this doll’s top isn’t slit–it’s closed like a dress). Underneath are worn loose pants that are tightened at the ankle. 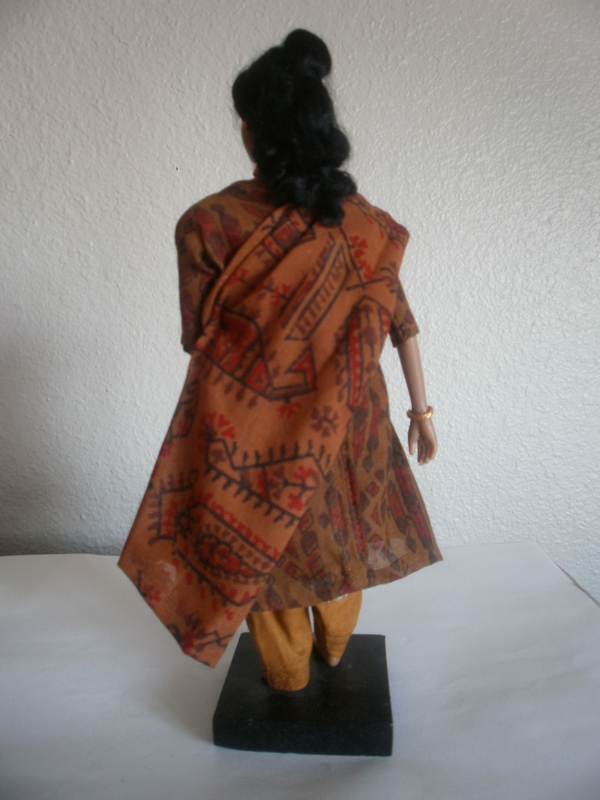 A dupatta (long rectangle of cloth like a shawl) completes the outfit. 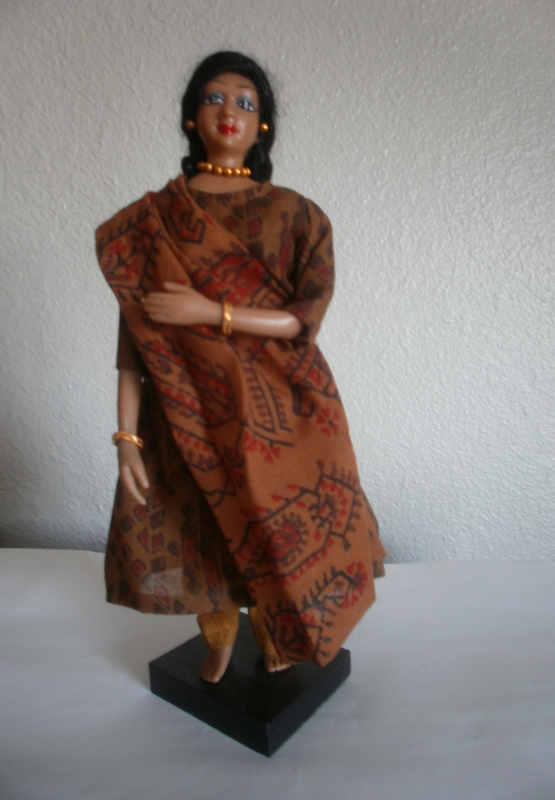 There are many different ways to wear a dupatta; I just draped this one over the doll’s shoulder and put in a few stitches at the side to hold it. Indian clothing often contains many beautiful, vibrant, complementary colors and patterns, and this outfit is no exception! 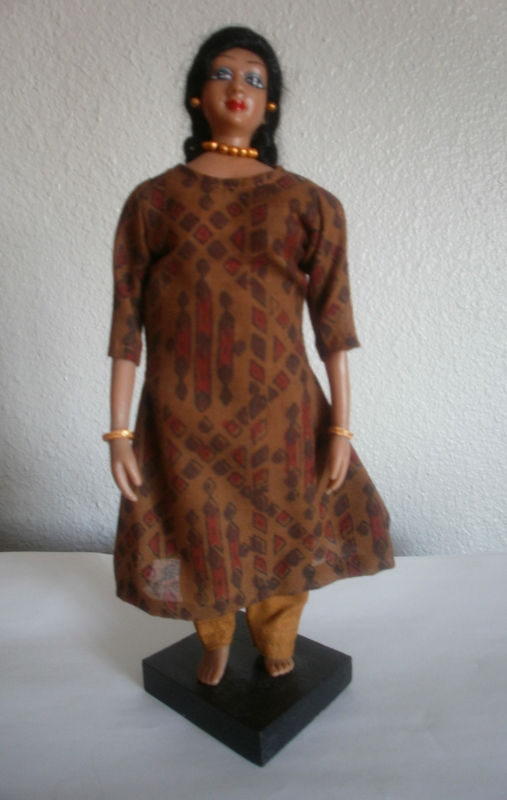 The doll is accessorized with a gold necklace, bangles, and earrings. This dress I made as a Christmas gift for my second-youngest sister (also the one I made the 40’s style dress for). The dress is similar to the Hobbit dress I made. As my sister’s favorite color is yellow, that’s what I made the theme 🙂 There’s a shirt/chemise of a pastel yellow, gathered at the neck and elbows with embroidery thread. The skirt is a patterned, straight skirt, gathered at the waist with a drawstring. The vest is the from Hobbit vest pattern, only in yellow felt. The material is from my grandmother’s sister. It’s a nice light pink with decorative eyelets sprinkled throughout. The dress is two layers of cloth while the sleeves are one. Hems are finished with a serge-type stitch on our sewing machine. 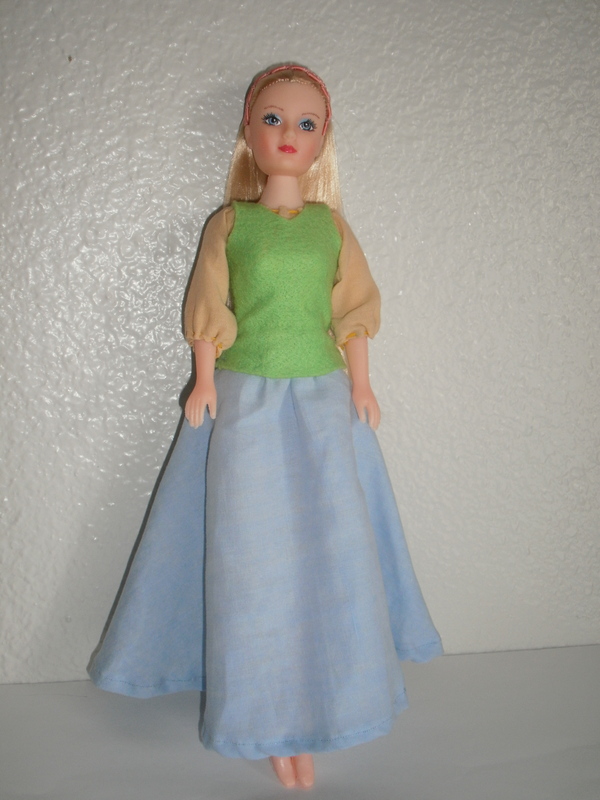 A green satin ribbon belt cinches the dress at the waist and completes the outfit. 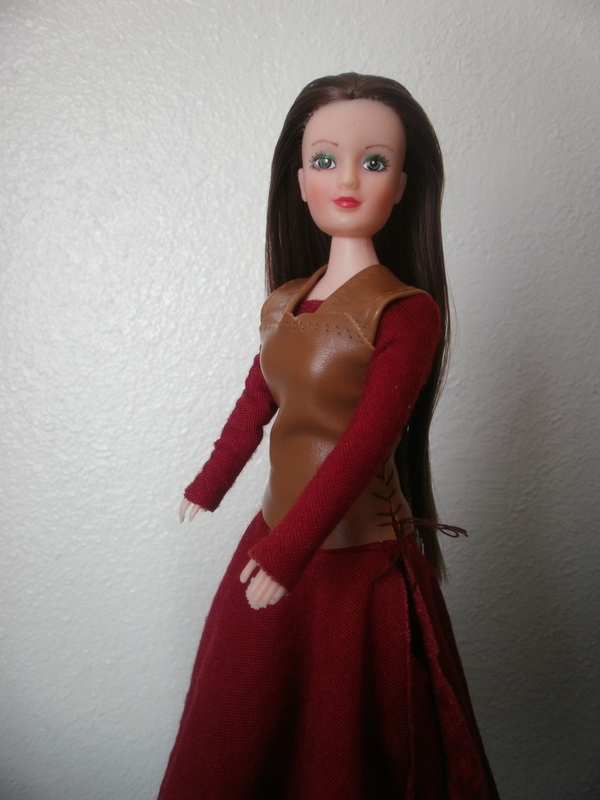 Susan Pevensie’s red battle dress was the inspiration for this dress–only I modified it into a more Lord of the Rings style. Let me explain 🙂 Susan’s dress, as are most of her dresses, is princess-seamed. And the slits in her dress are made by leaving two of the front princess seams unattached part of the way down the skirt. (See here and here for pictures that show what I mean.) 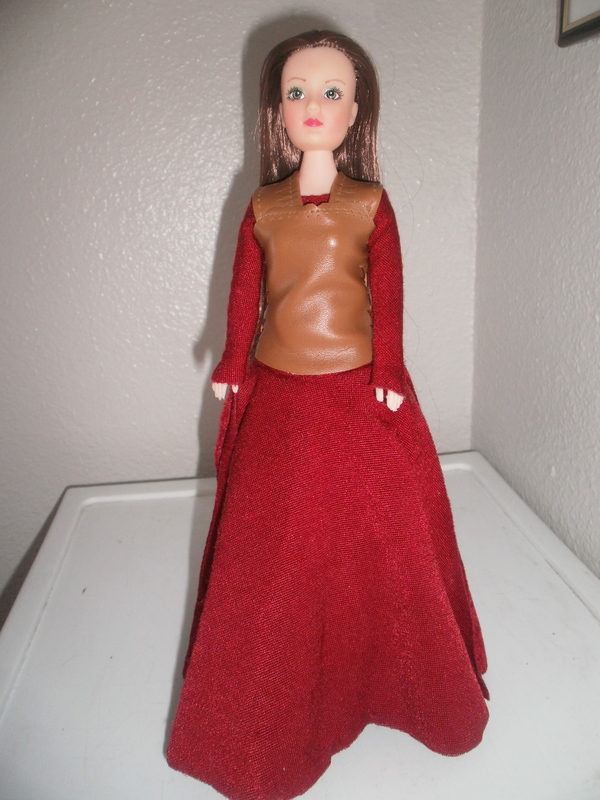 However, most LOTR dresses are fitted through side seams. So I did that with this dress and put the slits in the sides. I had some problems with making the slits at first, but eventually, I just cut the skirt pieces and sewed them to the bodice, but didn’t sew them up the sides. That gave a fuller skirt than slitting a dress up both sides. 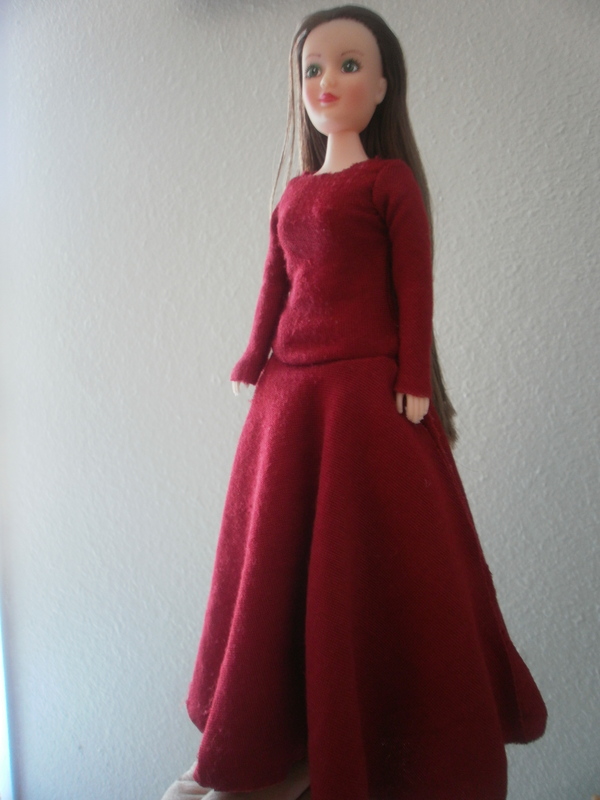 The dress is actually made from the same burgundy crushed panne velvet as the Cranberry Dress–only this time I used the other side of the material. Underneath is worn a red pleated underskirt of a thinner cloth. The doll’s cuirass is laced up the sides with cord I made from dark brown thread. I left off all Susan’s fashionable straps and buckles 🙂 and added shoulder straps made from the same leather as the cuirass.